Fri., 31 May - Sun., 16 Jun. Wed., 15 May - Sun., 9 Jun. Fri., 17 May - Mon., 17 Jun. Sat., 14 Dec. - Sat., 11 Jan. Tue., 17 Sep. - Mon., 14 Oct. Tue., 30 Apr. - Sat., 15 Jun. Sat., 15 Jun. - Fri., 6 Mar. Sun., 9 Jun. - Sat., 22 Jun. Tue., 30 Apr. - Tue., 25 Jun. Fri., 26 Apr. - Wed., 26 Jun. See all 103 properties in King Khaled Intl. 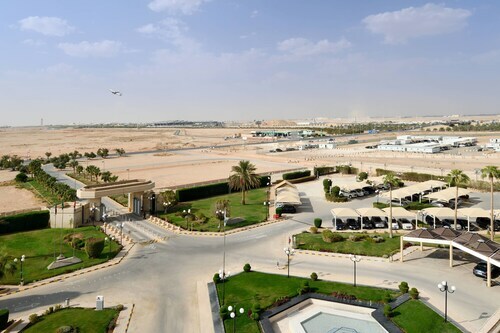 Situated near the airport, this hotel is within 12 mi (20 km) of Riyadh Equestrian Club, Princess Nora bint Abdul Rahman University, and Imam Muhammad bin Saud Islamic University. The Business Gate is 12.3 mi (19.8 km) away. 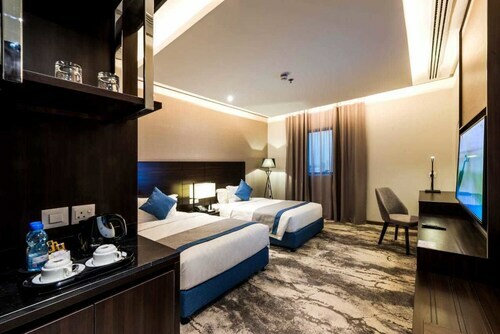 Located near the airport, this family-friendly hotel is within 12 mi (20 km) of Riyadh Equestrian Club, Princess Nora bint Abdul Rahman University, and Imam Muhammad bin Saud Islamic University. The Business Gate is 12.3 mi (19.8 km) away. 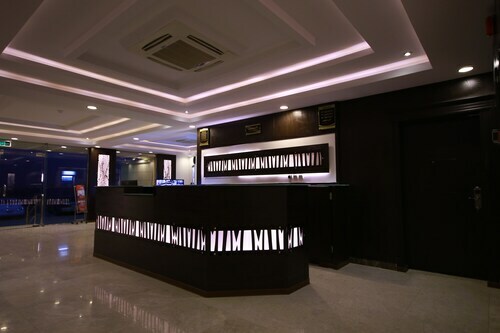 Situated in Riyadh, this hotel is 2.7 mi (4.4 km) from Princess Nora bint Abdul Rahman University and within 9 mi (15 km) of Imam Muhammad bin Saud Islamic University and The Business Gate. Azizia Mall and Al Nakheel Mall are also within 12 mi (20 km). 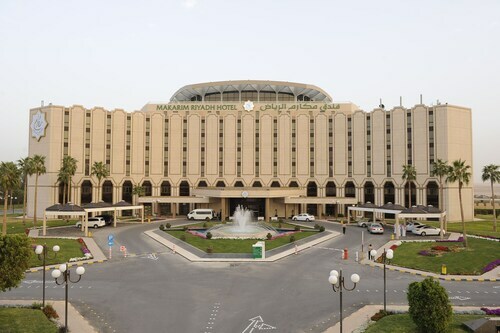 Situated in Riyadh, this aparthotel is within 9 mi (15 km) of Princess Nora bint Abdul Rahman University, Imam Muhammad bin Saud Islamic University, and The Business Gate. Granada Business Park and Azizia Mall are also within 9 mi (15 km). Situated in Riyadh, this hotel is within 9 mi (15 km) of Imam Muhammad bin Saud Islamic University, The Business Gate, and Granada Center. Princess Nora bint Abdul Rahman University and Granada Business Park are also within 9 mi (15 km). 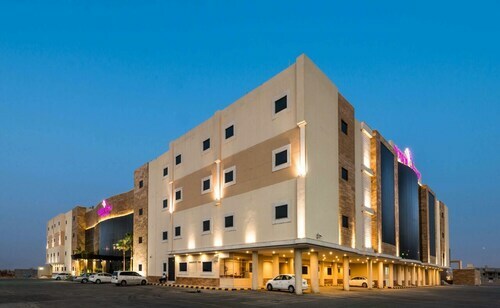 Situated in Riyadh, this luxury hotel is within 12 mi (20 km) of Princess Nora bint Abdul Rahman University, Al-Raidah Digital City, and Hayat Mall. Sahara Mall and King Fahd District Park are also within 12 mi (20 km). 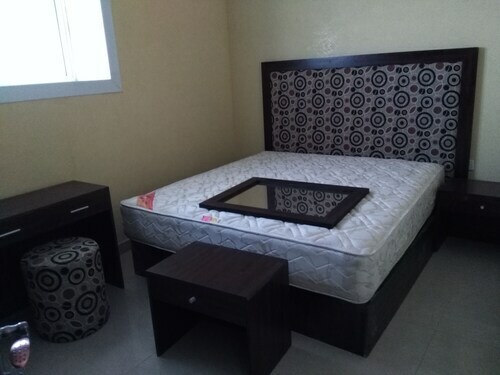 Located in Qurtubah, this hotel is 3.1 mi (5 km) from Imam Muhammad bin Saud Islamic University and within 6 mi (10 km) of Princess Nora bint Abdul Rahman University and The Business Gate. Granada Center and Al Nakheel Mall are also within 9 mi (15 km). Located in Qurtubah, this aparthotel is within 6 mi (10 km) of Princess Nora bint Abdul Rahman University, Imam Muhammad bin Saud Islamic University, and The Business Gate. Granada Center and Al Nakheel Mall are also within 9 mi (15 km). Question : How much time do people spend in Riyadh? Answer : The average time spent hanging out in Riyadh by passengers from Toronto is 28 days. However long you decide to stay, give yourself plenty of time to see what makes Riyadh fantastic. Question : How many flights are there per day from Toronto to Riyadh? Answer : Depending on the day of the week, the number of flight times will change, but on average there is only one. That is lower than the national average of six. Question : Which airline has the least delays from Toronto to Riyadh? Answer : Saudia will have you to RUH on time 75% of the time. Life has too much to offer to spend it waiting in an airport, so check out Saudia to get in and out of airports as quickly as possible. Note that if they do have a delay, it usually lasts about 36 minutes. Question : How much is a plane ticket to Riyadh (RUH) from Toronto (YYZ)? Answer : Prices range anywhere from $1,027 to $11,428. 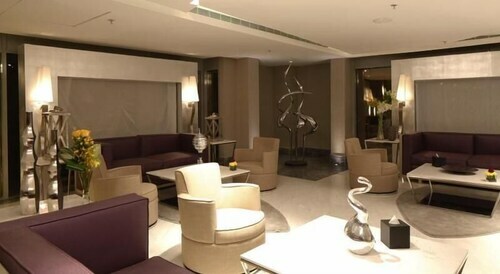 Booking far in advance can usually help you get the cheapest rate. Prices are usually cheaper the further out you book. Question : How long does it take to fly from Toronto to Riyadh? Answer : Flying from YYZ to RUH usually takes about 12 hours and five minutes. Remember, there is a time change of eight hours. Answer : The cheapest day to fly from Toronto to Riyadh is on Wednesday. If you are trying to save a bit of cash on your next holiday look for flights on that day. Question : What is the cheapest date to fly to Riyadh? Answer : As of Apr 15th, the best day for booking to Riyadh (RUH) is Apr 24th. A ticket for this flight will run you around $1,027, which is 52% less than the average price to book the same route. Flights from Vancouver Intl. to Jean Lesage Intl. Flights from Winnipeg James Armstrong Richardson Intl. to Sky Harbor Intl. Flights from Winnipeg James Armstrong Richardson Intl. to Stanfield Intl. Flights from Winnipeg James Armstrong Richardson Intl. to John G. Diefenbaker Intl. Flights from Vancouver Intl. to Punta Cana Intl.